I had a way too busy last term of school, and early summer was pretty busy too, so I haven’t done a post in way too long!! A few months ago my summer plans included re-writing the curriculum for where I was teaching, because I didn’t like how the Saxon books are SO scattered. I didn’t feel like the students were getting enough depth to build long term understanding when we were jumping all over the place. I think it’s a program that could work with a couple hours a day to dedicate to math… but with 45 minutes (less on Friday) it wasn’t working. But, on the last day of school I got a job offer for another school. It was a hard choice to decide to take it, but I think it will be a better match for me. I LOVED the school I taught at before (other than the Saxon books, which I wouldn’t have to use the next year anyway). My new school is switching to a new curriculum though, and we don’t get our materials till mid-August. So… not doing as much time lesson planning as I thought I would be. I’m not too worried about advanced planning though. Last year I taught many different classes, 6th-9th grade at a variety of levels, psychology, math lab, and once a week also did advisory and 2 enrichments. This year I have one class. I’m doing just 8th grade math. I might have an honors class and might have a remedial class (not sure yet), but whatever it is, it will all 8th grade math all using the same text. We are using the SpringBoard program so will have training for that in August a couple weeks before school starts. So what am I doing with my summer instead? And lots of house/yard work. But that’s not as exciting as the reading part. 1) The First Days of School by Harry and Rosemary Wong. I’ve read this one before and it seems like mostly common sense, or maybe just things I’ve learned other place already? But going to read it again this summer. 3) Teach Like a Champion by Doug Lemov. I’ve LOVED this book so far. Lots of very practical little and very concrete ideas for ways I can improve. Love it. Really, go read it if you haven’t yet. 5) Teach Like a Pirate by Dave Burgess. I’m not an over the top person or very overly enthusiastic, about much of anything. I get excited sure, but I’m not so great at showing that. Very calm and mellow 🙂 So this one has been a good one for me, might help get a little more of that into my classroom. 9) Personality Plus by Florence Littauer. This one talks about the 4 different temperaments and how to work effectively with those personality differences. For anyone familiar with them – I’m a melancholy sanguine according to the test in the book 🙂 Most of my strengths are in the melancholy temperament while most of my weaknesses lie in the sanguine one. 10) Newjack, Guarding Sing Sing by Ted Conover. This one’s not an education book, just one I’ve had for a while on my list to read. A few weeks before Pi Day I realized I had a LOT of options for what to do in class, and that many of them tied in well with history, science, english, music, PE, etc. So I emailed all the other teachers to ask if they wanted to join the Pi Day celebration. About half of them did. In science they talked about Einstein (who was born on Pi Day). 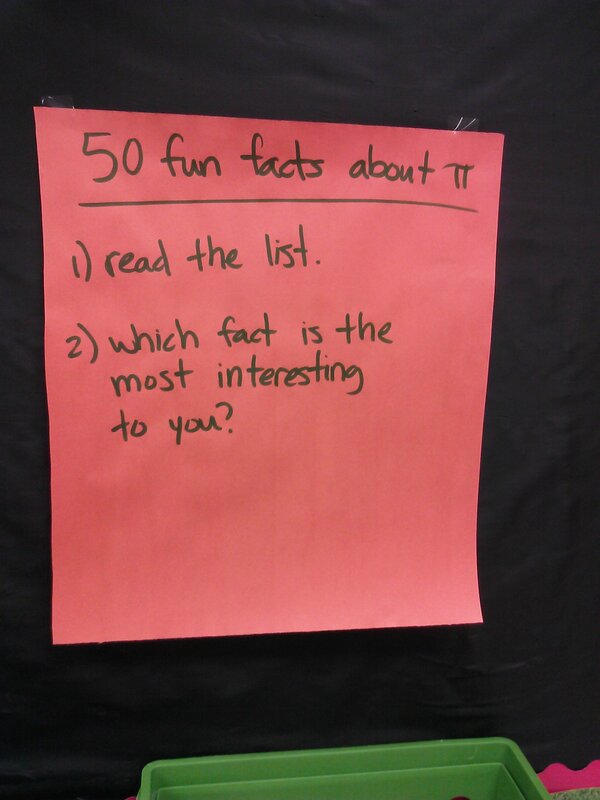 In history they learned about the history of the number pi. I was planning to as parents to bring pie, but the PTO offered to get pie for everyone! They got the “cutie pies” that are just individual servings already pre-packaged and everyone got one at lunch. Easiest way to serve Pi day pie ever! In math I had 7 stations set up. Stations 1-3 were from Yummy Math! If you teach math you really need a subscription to their lesson plans. My students love them, and the subscription is cheap. 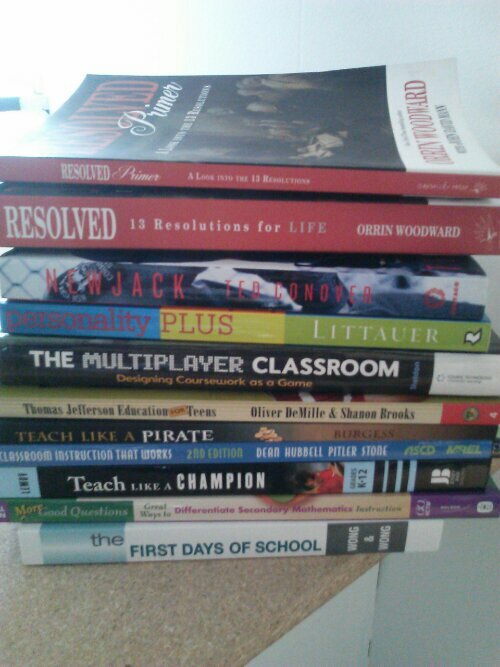 Lots of good lesson plans out there, but many are way too pricey for me. Not these ones! 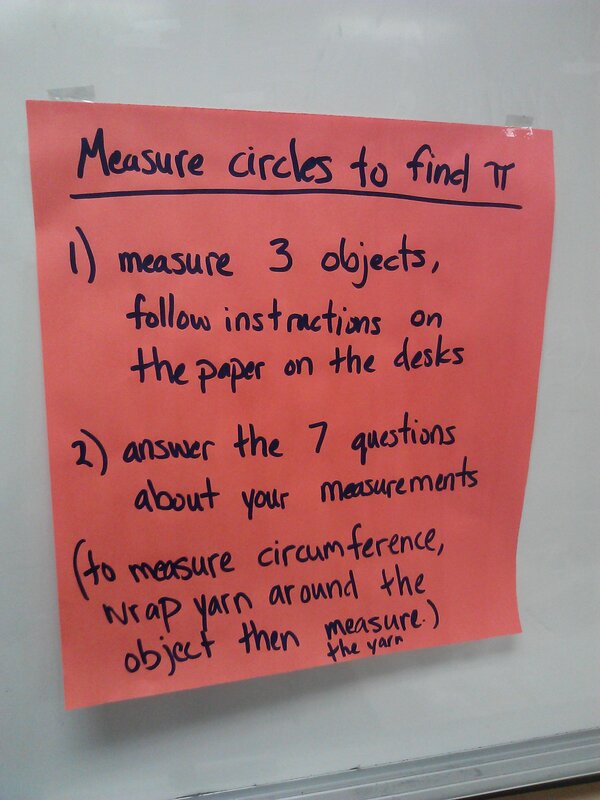 3) Finding pi by measuring circumference and diameter of circular objects (keep lids from your food! ), then dividing circumference by diameter. 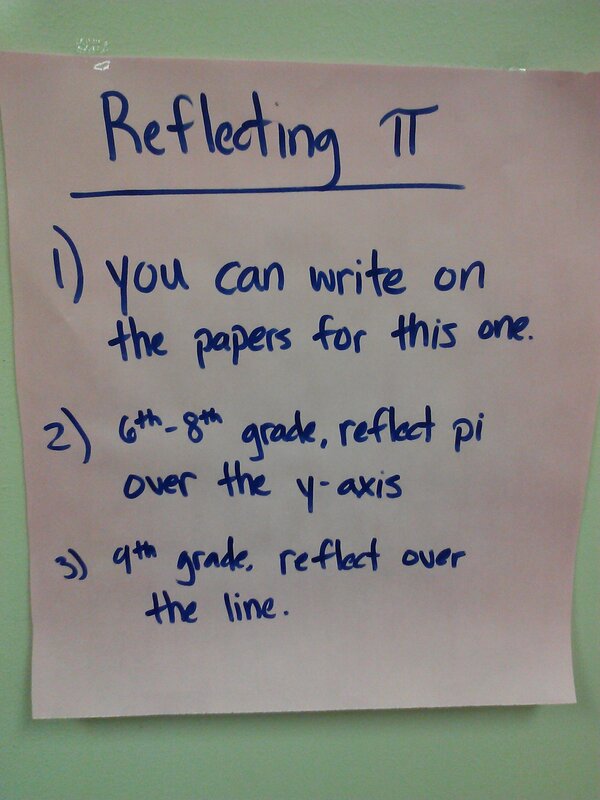 5) reflecting pi – 3.14 backwards looks like the word pie! 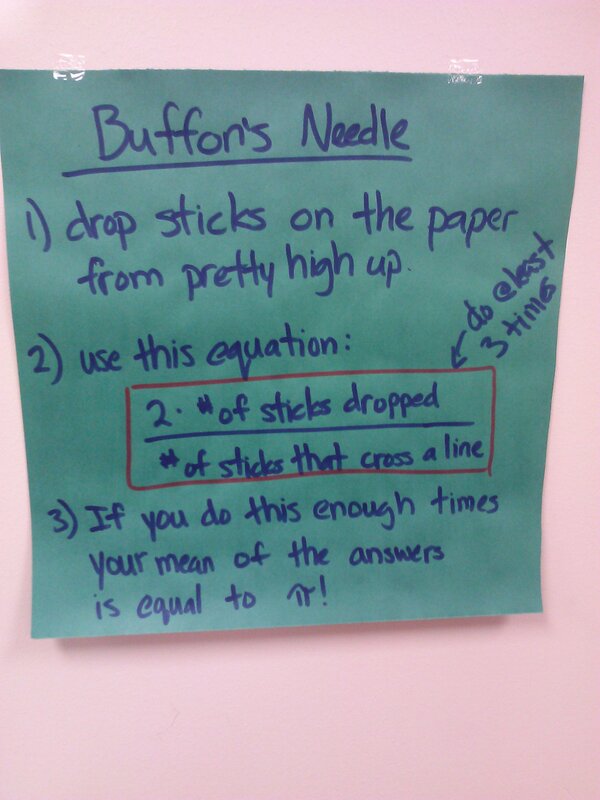 7) Buffon’s needle experiment. I put lines on a large piece of butcher’s paper for this one. The lines were exactly as far apart as a popsicle stick. They dropped about 15 at a time. I used these stations with 6th-9th grade and it worked great for all of them. For 6th-8th they could pick any station to work at as long as they were working the whole time. I encouraged them to try at least 3, but if they were really excited about one of the stations, they could stay there. 9th grade had to do station #6 (reflecting 3.14 over a diagonal line) then could pick anything else. for Sunday Funday 🙂 Helps keep me blogging when someone else comes up with the ideas for what to write about! This week’s topic: Math Centers! I use standards based grading for my 9th grade class and every once in a while it seems like they all just need a day to catch up on something – but it’s a different something for each of them. Twelve different math centers wouldn’t work so well with traditional centers 🙂 So I set up links on the class blog and reserve the mobile lab for the day. They look up any goals they are missing or have a low score on, then go to the links on the class blog for that particular goal. The links include tutorials, practice problems, videos, games. Whatever I can find online that might help them with that goal if they didn’t already “get it” when we worked on it in class. (or, more likely, if they weren’t here that day or chose not to participate that day.) Sometimes I will also scan in relevant homework with worked out solutions and notes from in class. It’s a good way to give everyone time to work on whatever it is that they need to do. Some students don’t need a catch up day, but almost all of them will have one thing they could work on. Even students who have perfect scores on all the assessments can still use the game links, Or can help other students. 1) Students who are convinced they can’t do it so don’t try. For this group I try to find ways to show success, and reward them when they do. Then when they get frustrated I can remind them about the one time they didn’t think they could do it and did. Something else I do for this group is try to find something they are good at and relate it to that. For example one girl who does cheer leading said in class that math makes her head hurt, so she doesn’t try. I asked her how she feels when she knows she does something perfectly in cheer leading. She had a huge smile and was excited to tell me about it 🙂 Then I asked her HOW she got to that point. Did she have to practice? Are some things hard at first? and those harder things feel even better when you practice enough to get it, right? She stopped complaining about math and that one conversation seemed to totally change her attitude about it! I’ve had similar conversations with other students. Just find something they are good at and help them see that work = success = happy feeling! 2) Students who really are already trying and still don’t get it. This group breaks my heart… It is a small group. But I have a few who try so hard and really just don’t get it. Most of the ones in this group are at least passing the class, but they want to do better, they get frustrated that math is so hard for them. For this group I offer help for 20 minutes before school each day and the school has tutoring available after school for an hour twice a week. I also teach a math lab class where they can get extra help, but many students who could have benefited from it didn’t have room for it in their schedule. For students in my Saxon classes I have a test tracker they use to see what concept they are missing on each test and where they can find examples in their book. 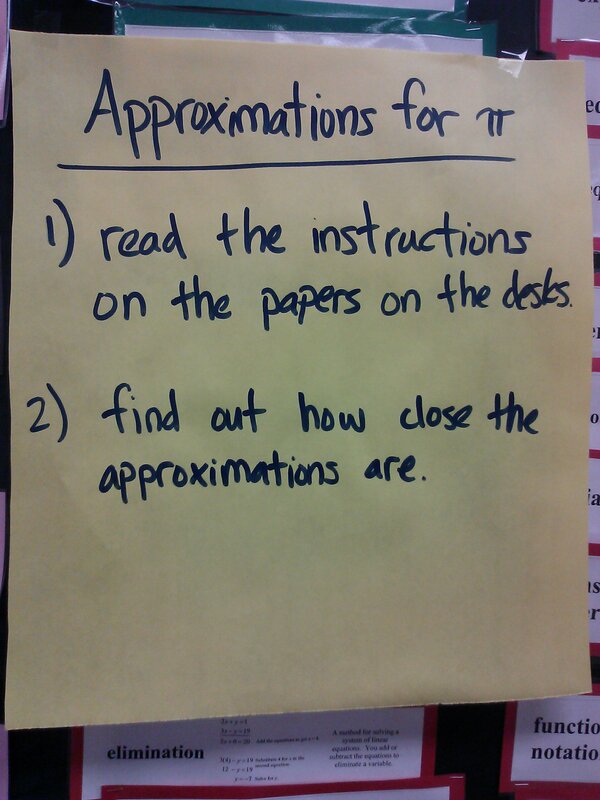 I then email the answer key to practice problems to their parents so they can check the practice work at home. For their daily homework I also allow them to pick what to work on, then they can focus on the areas that are more difficult for them. For the class I have that’s not Saxon (we use www.mathematicsvisionproject.org), I have a class website where they can go for extra resources. The class is set up on standards based grading. The class website has a resources page where they can find the standards listed. Under each standard I have videos, tutorials, examples, practice problems, etc. I encourage them to go there for help. This has been especially useful for one student who is gone about half the time. 3) The last group of kids falling behind are just unmotivated. There are different reasons they are unmotivated, but for some reason they have decided to not care, or at least act like they don’t. 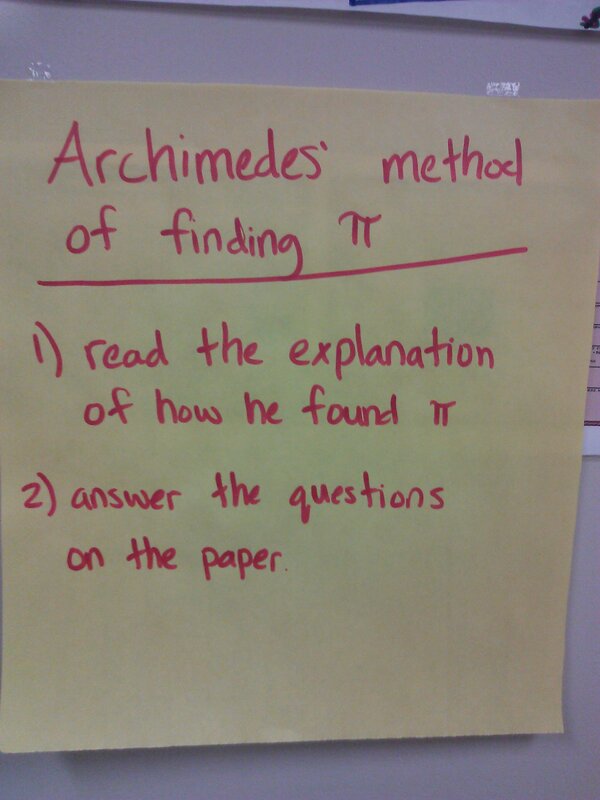 Some of these students act this way because they don’t understand the math. I kind of treat everyone in this group as if that’s the reason they are acting unmotivated. I’ll also try to tie in something that interests them, like when I used a football analogy for systems of equations. For this group I also try to make sure they know that I am there for them if/when they want to work on it. And sometimes they do decide they want to try! Getting parents involved helps with this group sometimes too. Well… this is what I’ve been doing so far to help them out! I look forward to reading all the other ideas from this week’s Sunday Funday! This past Tuesday at the Global Math Department Max presented a conference on noticing and wondering. I’m glad I was there for it! I learned a lot about tying in what students already know to what we are trying to learn next. I’ve heard of and used KWL’s before (know, want to know, learned), but noticing and wondering worked so much better!! My 9th grade class really struggles with math. Many of them get very frustrated and shut down when anything seems even slightly challenging. Unless it’s interesting too. Or is presented in an excessively non-threatening way. Asking what they notice instead of what they know did that for them this week. We actually got through what I wanted to for the day plus some extra things. We are learning about features of functions (maximum, minimum, increasing, decreasing, intercepts, etc.) and how that all looks with graphs, tables, equations, and in interval notation. Aly and Dayne work at a water park and have to drain the water at the end of each month for the ride they supervise. Each uses a pump to remove the water from the small pool at the bottom of their ride. The graph represents the amount of water in Aly’s pool, a(x), and Dayne’s pool, d(x),over time. – what a(x) means, and what a(5), a(6), etc mean. – what does d(x) = 2000 mean and what would that x value be? For my regular education classes (not honors) it’s pretty easy for them to keep track of what we are doing. We just go in order of the book except for rare occasions. For my honors classes sometimes we will do two lessons in one day, or do them out of order, or take time off from book lessons and do something else. I’ve always had the students write what we are doing each day in their planner and in their notes (if we took notes). It’s a requirement in our school that we state an objective for each day clearly for the students. On my first evaluation one of the things I was marked down for was not having the objective posted, and just when I was projecting my copy of the notes apparently doesn’t count, even though I was told it would when I asked… I’d get over it a lot easier if that evaluation didn’t impact what I am paid 😦 Oh well, evaluations = different pet peeve. So, moving on, not only does the objective go in planners and on notes, it needs to be posted during the full class time. One of the teachers has an extra whiteboard in the back of his room where he just writes everything at the beginning of the day. But I only have one white board. One of the teachers writes hers at the side of the white board, but it looks cluttered and messy with 6 different classes listed up there. One of them has laminated papers on a bulletin board, and that’s kind of where I got my idea. My solution was to cut out large pieces of paper and laminate them. I have one for each class. Color coded of course 🙂 Everything for my classes is color coded. 6 classes: Pink, Orange, Yellow, Green, Blue, Purple. 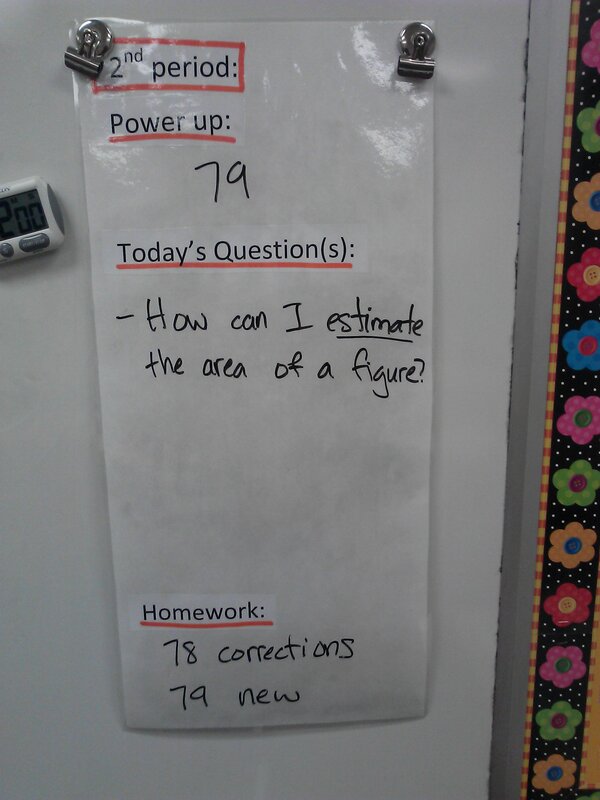 On the papers I have a place for their power up (bell starter), daily question(s), and their homework. Its working really well! I have everything written for the students, they know where to find it, they have no excuse for doing the wrong lesson, it keeps my board uncluttered, and it still allows me time to meet the students at the door instead of standing up front writing when they come in. At first all of my students were required to do the same 30 problems from their math book. There was no choice, no varied levels, they all did the same work. The only differentiation in homework came from what class they were in. The honors class was one book ahead of the regular class. I realized pretty early on that this was a problem. I also realized that doing 30 problems every night was encouraging cheating and discouraging checking their work and slowing down a little. They were stressed, overwhelmed by doing 30 problems, and just rushing through it to get it over with rather than to learn from it. Now students pick 10 problems out of the homework assignment. We use the Saxon math program, so homework is spiralled. There will be many different types of questions on each homework assignment. They also don’t turn the homework in every day anymore. We will check all 30 problems in class and they are required to go back and fix the ones they missed. In hindsight, I think I should have said 15 problems instead of 10, but it is working out with just 10. I have popsicle sticks with names on them and draw 3-4 students each day. I only check homework for those students. I check to make sure they a picking appropriate problems, showing ALL the steps, and correcting anything they missed. Going into this one of my big concerns was that they would just pick the easiest 10 problems. And some of them do. But they are the same ones who just didn’t do any homework before, or copied it from someone else. So they are still doing more than before! Most of the students however are picking good problems. and some do more than 10 if they have time to or if they think there are more they need to practice. The rest of the conferences were pretty much a stream of parents saying thank you for recognizing the needs of their student! They’ve observed that their students are enjoying math more (something I think is important because junior high is about when many students decide they don’t like math). They have seen their students go back through notes or the book instead of just guessing and moving on if they hit a hard problem. Several of them also said tantrums, crying, etc over math homework has stopped. I have noticed in class that students notice their own mistakes more often (and mine, which they get points for!) Their conversations are related to math a little more often than before. they are asking better questions. They are asking why more often. They are showing detail, they are looking for patterns. They are doing much better with the Common Core’s 8 mathematical practices! They also are more aware of what they get already and what they still need to work on. I never used to have students come ask for extra practice on a certain area before. Now they do. They know what they need to work on and focus on those types of problems. By request from @jreulbach at http://ispeakmath.wordpress.com/ – this is how I teach graphing. On twitter she mentioned that her students struggle with graphing, but could solve a system using substitution. Very ironic because mine get graphing but took forever to get substitution! A lot of how I teach graphing came from the curriculum my school uses for 9th grade. Also, with any subject I teach I try to make as many connections to anything else they know as I can. For my ninth grade class very first we started of with what an intercept is. I introduced that with football. When someone intercepts the ball, their path and the path of the ball cross. To talk about slope I showed them this cartoon. They get confused when graphing because for slope you go up first, then over next. 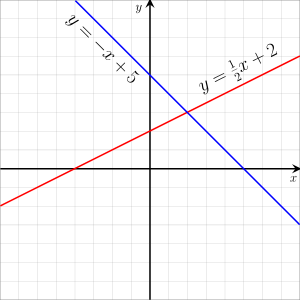 For graphing a coordinate you go over first, then up/down. We had a graphing competition that seemed to resolve that. They were in teams and had to find the correct point if I gave a point, and the correct slope if I gave a line. First team to get it won that round. Those two things didn’t take very long, about one day each. It was stuff they’ve learned before, just needed reminded of. As we went through the rest of the unit we used the organizer found here. but instead of printing this out to give to them, I had a blank grid we filled in as we went along. Only the honors students did the matrix, everyone did graphing, elimination, and substitution. We learned graphing first, then the other two. I also used this method for notes. We only filled in the organizer once they had it down. I also had them write slope-intercept, standard, point-slope, and recursive formulas for lines we were working on. and practice going back and forth between the different forms, and graphing from the different forms. Once we know how to graph one line very well, we get into two lines. I start by introducing it as another kind of intercept. But instead of looking at the x or y axis, we are going to use another line. I go back to football on this and explain it like someone tackling another player. The two have to cross paths for that to happen. After we graph the two lines I have them pick the point where it looks like the lines cross, plug that into both equations, and see if they are both true at that point. If they are both true, that one point works for both lines. So that has to be where they cross. If it doesn’t work, that’s not the right point. I’m REALLY emphasizing checking work with all my students and that seems to help also. It helps them get better at catching their own mistakes before they practice too much the wrong way. For the younger grades, that aren’t into systems yet – they are just learning graphing – I still use the same slope and intercept instructions, and we still practice the confusing slope vs. graphing a point problem with the game. That seems like the biggest confusion for them. You start vertical for finding slope, and horizontal for graphing. With the younger ones I also have them create pictures with graphs, then give someone else the instructions for making their picture. Here’s an example of how to do pictures with graphing, but instead of giving my students one I have them create their own. Depending on how long we have to work on it I’ll have them do a picture with anywhere from 10-20 points as the minimum. One of my goals for my 9th graders is that when I give them an equation, a context (story), a table, or a graph for an exponential equation, they can create the other three things I didn’t give them. They could do the equation, table, and graph parts pretty well, but struggled with coming up with a context to match it. We kept doing examples in class, but they just weren’t getting it yet. When we did examples I had them come up with a context then check to see if it matched the table when they plugged in the x values. Math Lab – a.k.a. Study Hall. My last period of the day is now a Math Lab. The class consists mostly of students who either 1) have decided they don’t want to do math homework, 2) they don’t understand it, or 3) they are too distracted by everything and anything to get it done. My biggest struggle with the class right now: how do I make it meaningful for the students in there? With that class I feel like I’m a babysitter more than teacher. About half the students are from my math classes, and about half of them are from the other teacher. The class is 6th through 9th grade, WIDE range of abilities. The class has 15 students. 12 boys and 3 girls. 2 of the girls are there just because they didn’t know what else to take, but don’t need help in math at all. They often go help other teachers or help the students in my math lab who need help and actually have something to do. The third girl seems to fall into the “doesn’t want to do it” group, but I think a part of that is that she doesn’t get it and doesn’t want to admit that. The class structure involves about 5-10 minutes at the beginning of class talking about something to do with organization, test taking strategies, basic facts review, etc. Then they get homework time. It’s pretty easy for me to make sure my students have something to do. I know what they need help on. Not so easy for students from the other math class. They always tell me they have nothing to do. Every day. One of the other difficulties with this class is that many of the students are very… very, VERY easily distracted. The tiniest little noise, or comment, anything, is enough to distract them from what they were doing. And with half of the class (at least) falling into the easily distracted group, it’s like chain reaction anytime one of them gets distracted. My solution to that has been to allow headphones and music. It DEFINITELY has helped, for the ones who bring them. I’m now also making a sort of “wall of remediation” but in hanging files. Then there will never be any excuse for not having anything to do. I think I’m also going to a no talking rule 😦 I hate doing it because I think being able to talk about math is SO beneficial… but in this environment? it doesn’t seem to work to allow it. Maybe once they are used to working quietly and can show me they know how I can have them earn the privilege of talking? I teach math and psychology to 6th - 9th grade. I also love spending time with my kindergartener :) and in any "free time" I love biking, swimming, and working on my house.